Gresham House Strategic PLC (LON:GHS) Managing Director Graham Bird caught up with DirectorsTalk for an exclusive interview to discuss the highlights of their final results for the year ended 31st March 2018. Q1: You recently published your full year results for Gresham House Strategic, what were the key highlights from those results? A1: We published our results to the year ended 31st March on the 19th June, so we’ve been out talking about those. The performance in the 12 months was a good performance, very pleased that the NAV, Net Asset Value, was up 10.7% compared to the previous year and that is against the market which in the same 12 months the All-Share was down 2.4% and the SmallCap Index was broadly flat, just down a fraction at 0.7%. So, it was a fairly significant outperformance which was nice to enjoy during the year. Of course, we also paid a 15p dividend during the year so our total return for the year was 12.1% so pleasing performance. Since inception, which is when we took on the mandate back in August 2015, the fund on a TSR basis is now up 21.7% so we’re reasonable pleased with the progress so far, albeit that we are still reasonably early into a number of the investments. So, those are starting to do reasonably well. As we look back on the year, I think the year was really characterised in three thirds. We had a very strong third of the year and then we had a weak middle bit where actually our largest holding, IMImobile not only saw a softness in its share price but also share prices of Quarto which is another investment that was also weak over the summer last year. As we came in to the final quarter, a number of investments we hold had good results and IMImobile’s share price and being such a significant part our portfolio, the share price of IMImobile made a big difference, they performance strongly. So, we ended the year really strongly, so I was very pleased with that. Performance was good, driven really by, as I mentioned, the key drivers, IMImobile, Northbridge Industrial Services also had a good end to the year which helped performance and a number of our smaller holdings likewise, contributed to the performance. That was partly offset by a slightly disappointing share price performances from Be Heard which had a profits downgrade in early January, really a hiccup in its strategy, they’d made a number of acquisitions and although there was strong organic growth, 25% year on year and EDBITDA was doubled in their financial year to December, they missed their forecasts so that led to a share price fall. Of course, Quarto, as I mentioned, but other than that, the portfolio did very well. I think the other point, just to note from the year, is that as we entered the financial year, we still had quite a lot of cash on our balance sheet so the financial year to March ’18 was focussed on getting cash invested. So, we invested £11.1 million during the year and really now if you look at the portfolio, it is broadly fully invested, just a little bit of cash on the balance sheet but essentially, we are now fully invested which means that we haven’t got the same cash drag that we suffered from a little bit in the previous financial year. We also exited a couple of positions, £3.6 million of recent realisations during the financial year, all of them achieved our 15% IRR target at attractive money multiples so we’re pleased that demonstrates the strategy does work when we see the catalysts coming through. So, that left us, at the end of the year, in a positive frame of mind and looking forward to the next financial year. Q2: What were the key highlights since the period end in March? A2: What was pleasing actually, as I said, we had a strong finish to the year in terms of NAV performance and since the end of March, the Net Asset Value has held up quite well and I think that was pleasing particularly in a market which has been reasonably volatile. I think the significant step that the Board took was that the strong Net Asset Value performance in the first quarter of the calendar year, the last quarter in our financial year, wasn’t matched by the share price rising so the discount has widened. So, we took the view that we should go into the markets and the company has bought back £1 million of shares, did that alongside some other institutional buyers including Gresham House itself who have increased its stake in GHS and now it’s just over 23%. On the back of that, buying back shares, we’ve seen some NAV enhancement as a result of that and the discount has narrowed quite considerably. So, it had peaked at just over 30% and it’s back down below 20%, I still that represents a very attractive buying opportunity and our ambition is to see that close significantly further in time and I believe it will. The other corporate piece, I guess, was an increased dividend. This time last year, we paid a 15p per share dividend and the directors have announced in the results that they’re proposing to increase that by 15% so a dividend of 17.25p is being proposed for approval at the AGM. I think combined with the share buy-back, there’s a strong demonstration by the Board that they do focus on shareholder value, there is certainly an ambition to have a progressive growing dividend and I think that it integral to delivering on shareholder value over the long term. They certainly offer their willingness to step in with buy-backs when merited and when cash can be used prudently to help close the discount and enhance NAV which has certainly been the case in this most recent buy-back. So, the share price has reacted well, pleasing to see that discount narrowing to some extent. The other post-period event, we have had one further significant investment, we invested a further £2 million into Northbridge Industrial Services via a convertible loan note. I think this is an excellent example of how having a strong relationship and a collaborative and engaged relationship with management teams can create opportunities where we stepped in to help the company refinance its banking facilities which will come up for renewal this time next year so giving themselves 12 months in advance to do that. By putting in a £4 million convertible loan note, which as I said Gresham House Strategic put in £2 million, that enabled the company to fully repay one of its bankers, KBC, and create new facilities with one banker, RBS, on attractive terms. The convertible loan note, because there’s no capital repayment during the term, gives them a bit more flexibility around cash management and so on. So, certainly from our perspective, an attractive instrument, it’s paying 8% coupon, it has a conversion price of 125p and very pleasingly, the share price has actually now risen above the conversion price so that’s turning into what looks like a very nice investment for us. We also had one further realisation, we had exited our investment in Miton. Miton has performed very well for us, essentially, the catalysts that we identified and the milestones that we believed would drive the share price forward have largely played out and we exited, having held the stock for just over 2.5 years, we exited with a 1.6 times money multiple and 26% IRR over the period that withheld that. So, a good case study of how we were able to work alongside the company, identify some catalysts and whilst I think Miton will continue to do well, the catalysts and our style of investing which really focusses on those milestones, have played out and hence we’ve taken some money off the table. So, yes, a good start to our next financial year. Q3: Finally, what can you tell me about the current position and the outlook for the Gresham House Strategic fund? A3: As I say, I think the Q1 of our financial year, which we have just gone through, has been a pleasing start, I think, overall, the portfolio is in generally a good place. Following their results, actually just this morning, they’ve announced they’ve a further acquisition of a company called Impact Mobile which is a leading messaging and consumer engagement based in Canada and they’ve paid C$25 million for that plus C$2 million of deferred consideration to be paid in 6 months. This is a business that’s generated C$4 million of EBITDA and with a growth rate of about 17% so I think very attractive multiple, it’s all been funded through cash and a banking facility so meaningfully earnings enhancing and providing great platform to extend their other capability into the North American market. Impact Mobile does about 20% of its business in the US and 80% in Canada so it gives IMImobile a good beachhead to continue to develop a story in the North America market. Again, a complementary fit, the ability to take in the product that they’ve got so looking forward to significant further development on that front. Northbridge, again I mentioned, the outlook for the oil and sector to which Northbridge has significant exposure has improved materially in the first quarter and first half of this year. We started to see rigs being towed back down to Australia which is meaningful for Northbridge, so I think that’s a business which is well positioned and could be a strong contributor to NAV performance in the next 12-18 months as we see activity resume in the oil and gas services sector. So, I think from a portfolio perspective, we’re feeling reasonably confident about where things are, a number of strong performances and good results have set companies like Augean or Centaur, various others in the portfolio up. I mentioned Be Heard having a disappointing start to the year, I think longer term, they’re in the right place albeit that in the advertising sector, there’s probably a little bit of softness at the moment and so, we may see some continued softness there but certainly over 2-3 years, they’re in the right place. That’s really interestingly been vindicated by Martin Sorrell, who publicly recently left WPP and has launched his own vehicle which is also focussed on a similar area to Be Heard so identifying that opportunity to take business from some of the larger players, particularly in the digital space, and interesting that Martin Sorrell has gone into that same strategy. So, I think Be Heard are well positioned for the longer term, I think we’ve just got to see through some of the softness in the market more generally, it’s recent win with Aviva, which was out last week I think, is positive and they’ve got a new Finance Director in Simon Pyper who I think is making a very big difference, so I think that’s positive for them. I guess if there is one sort of slight concern in the portfolio, it remains Quarto which had a very public shareholder spat at the AGM in May where founder and another significant shareholder who had been acquiring shares at the beginning of the year, turned up at the AGM, and voted off the Chairman and the Non-Executive Directors. That in itself triggered a change of control clause with the banks so just some uncertainty around that, the business carries a lot of debt and given that the movement in Board and so on that’s gone on there, that’s one where there’s still a lot of uncertainty. So, I guess that’s probably the one that keeps me slightly awake at night. Having said that, I’ll just finally say that it’s a good time to be looking at the UK market, although it’s still reasonably highly valued, I think on a relative basis compared to other markets around the world, it’s looking quite attractive so a good time to be looking at the UK. I think it’s a good time to be looking at small caps and the valuation anomalies between large and small remains very wide so that’s an attractive time to get in and find value. I think it’s a really good time to be thinking about funds and investment strategies with value orientation, particularly as finding value has become more difficult and it’s a good time to be looking at stock picking for the same reasons. 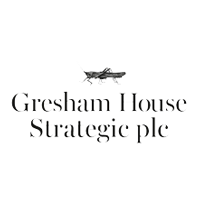 So, I think all of those things bode well for Gresham House Strategic, the portfolio is well positioned and I think from a macro perspective, a good time to look at these type of strategy.